Card Size: 2 3/8" x 3 15/16"
Notes: These cards are in playing card style, but cannot be used as a deck of cards since the set is missing 8s and 9s and the back designs are all different. The cards are numbered in four groups from 1-12 with no 8s or 9s. 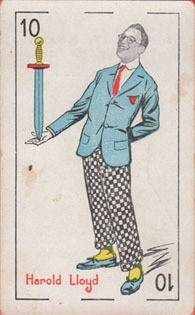 They are not in the traditional suits of spades, hearts, diamonds, and clubs, but instead are in groups of circles, swords, wine glasses, and clubs. The backs say "Gran Fabrica de Chocolates Bombones y Caramelos. Los Megores Del Mundo." This translate into english as "Great Chocolate Factory Chocolates and Candies. The best of the world." Thanks to Amit Benyovits for providing the information for this checklist.